Something exists within our human psyche which draws us into exploring our own and natural boundaries. Thrill-seeking satisfies even the hardest on men, though natural boundaries have there draw too. Though the Southern Alps are deservedly graced with glory it is the beautiful coastline which dominates these islands. Standing at the edge of the land looking over the water evoked feelings of change and new beginnings for us both. 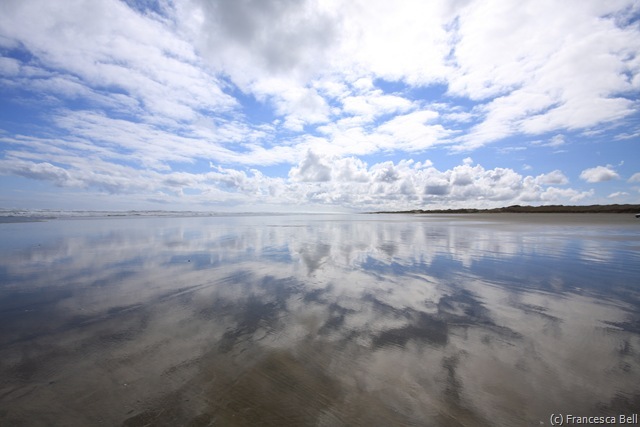 Mile upon mile of endless beaches where the sunlight washes over the sand and reflects the sky like a mirror. Dominating cliffs guard over idyllic coves from the pounding waves and rocky outcrops that are home to seals, penguins and sea-birds. The seascape relentlessly demonstrates its prowess as several rows of waves roll towards the shore at any time. Waves pound the seemingly impenetrable rock like a magical sculptor with only fine grains of golden sand left behind. Home to all creatures great and small, the wealth of wildlife is a dream. Seals and seal-lions bask in the sunlight after a few days fishing. Yellow-Eyed Penguins surf and dive through the waves at sunrise and sunset. Even whales are drawn here to feed in the extensive larder at Kaikoura. The Maori people, originally from Polynesia, arrived in New Zealand by waka (canoe) and named it ‘Aotearoa’ loosely translated to ‘The land of the long white cloud’. Weather systems play an important role in shaping these islands. Heavy rain clouds roll in over the Tasman Sea and empty down the spine of the Southern Alps before dispersing to allow for glorious sunshine on the Eastern Plateau. Each coastline is pounded by a different sea with the Tasman Sea on the western side and South Pacific Ocean on the eastern side. These two seas meet at Cape Reinga in the North and Stewart Island in the South where waves come head to head and crash over on another. There are many hidden gems to offer around both islands and here are some of our highlights. 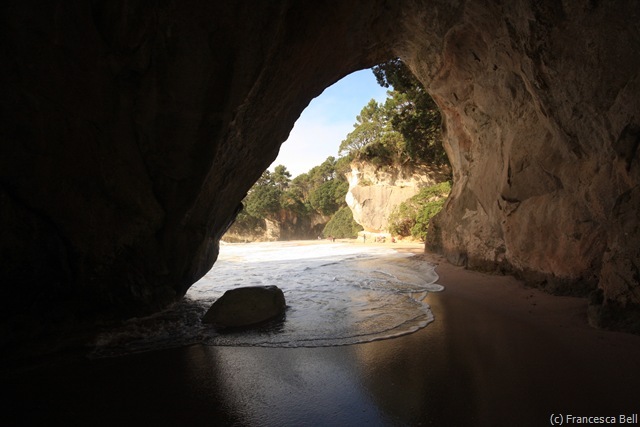 Many beaches dot New Zealand’s coastline drawing locals and tourists alike. Ninety Mile Beach (in fact only 55 miles long) is located on the west coast of North Island’s Northland region and is the most famous and impressive beach in NZ. Several stories abound as to why it was so called with the most popular one claiming that missionaries, capable of travelling 30 miles a day, took three days to traverse the beach and so claimed it to be 90 miles long without taking into account the slower pace of their horse on the sand. This does not in any way detract from this impressive place where sea meets land and sky meets earth creating a wondrous reflection. It is hard not to be inspired here. The natural reflections inspiring internal reflections within ourselves. As we made imprints into the sand we passed a sleeping seal-lion on the sand. Blinking slowly, with only inquiry but no concern, he patiently waited for us to amble on. Drive along the beach is popular, but for us this was impossible in our ‘Mammoth’ campervan. Upon reflection I think it would have separated us from the emotional influence this place has. 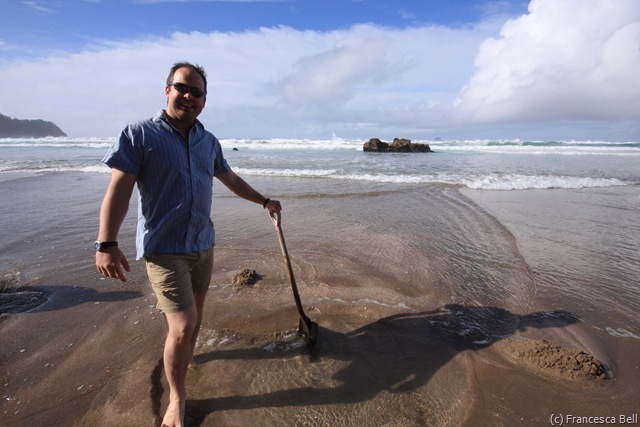 No trip to NZ is complete without taking a shovel down to Hot Water Beach in the Coromandel. 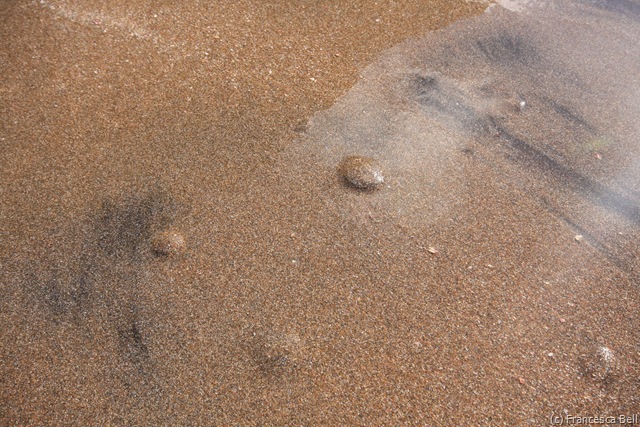 Due to a wonderful freak of nature extremely hot-water bubbles up through the sand enabling you to indulge in a self-dug spa-pool on the beach. Tide permitting that is! We were there during Spring tides which was a challenge. Man power is nothing against the power of the sea. Hurriedly digging at the beach and pilling the sand to create a pool only to see it washed clean away was a humbling experience. Time and time again people persevered with many working in teams to help one another, but eventually they all ended up falling the the same fate. Finally, the women were sat in bottom sized hot puddles with the men holding spades looking bemused at their defeat. A very funny experience though I’d go back again in more conducive conditions as the reward is well worth the effort. Especially for those couples where the men did all the digging! 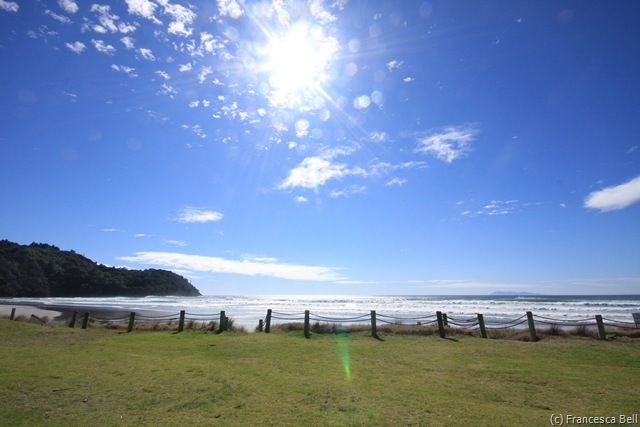 Waihi in the Bay of Plenty is another glorious long golden beach with the perfect break for the surfer within. For those not ready to take the plunge into the winter waters the Top 10 Holiday Park here offers a surprising sophistication with a wonderful long pool, kids pool and water slide, an outdoor spa and parasol covered deckchairs. By far the most impressive rock formation we found was in the Coromandel Peninsula’s, where ‘Kiwi’s go for their holidays. 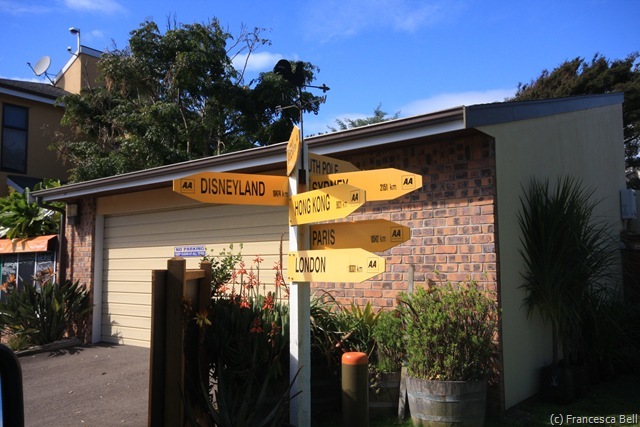 Hahei is a lovely coastal town from where you can enjoy a short bush walk to the secluded location of Cathedral Cove, so called after the cavernous cathedral-like arch worn out of rock proudly standing there. 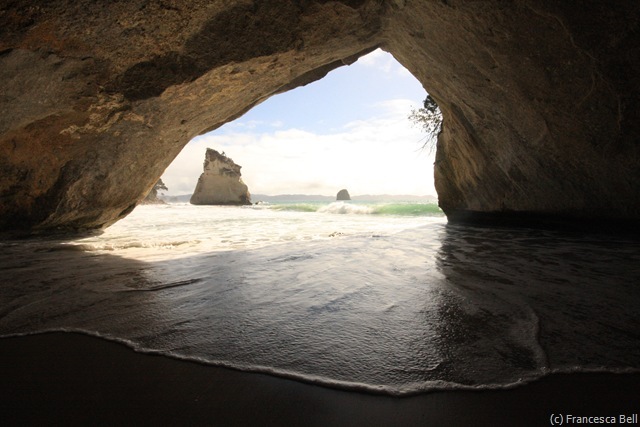 At low tide the cove becomes a grand entrance to the next beach which is beautifully framed by the rock arch. With sand squeezed between our toes we paddles in the waves and took a romantic moment to gaze upon this beautiful natural wonder and each other as we remembered the vows we made exactly four years ago. Happy wedding anniversary, darling. The east coast of North Island gets more than its fair share of sunshine and is a good place to spend time when the rain sets in at Tongariro National Park. 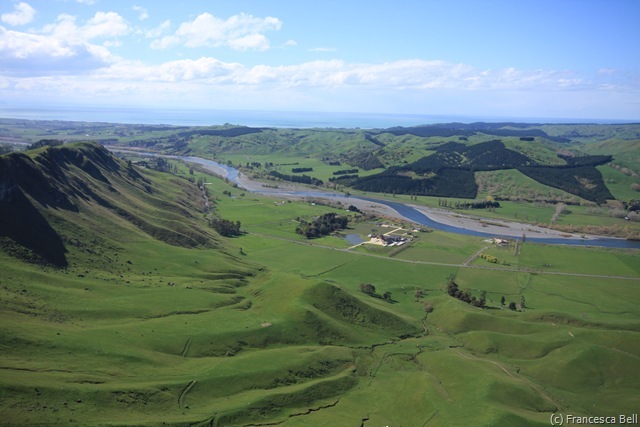 From the peak of Te Mata the coastline displays stunning. ridges, plateaus and distant mountains. 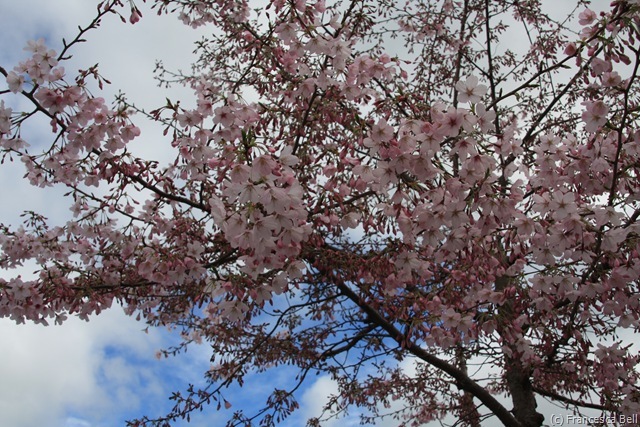 Within this undulating region the earth bares much fruit enabling local vineyards to produce award winning wines and local bees to produce sweet manuka honey. 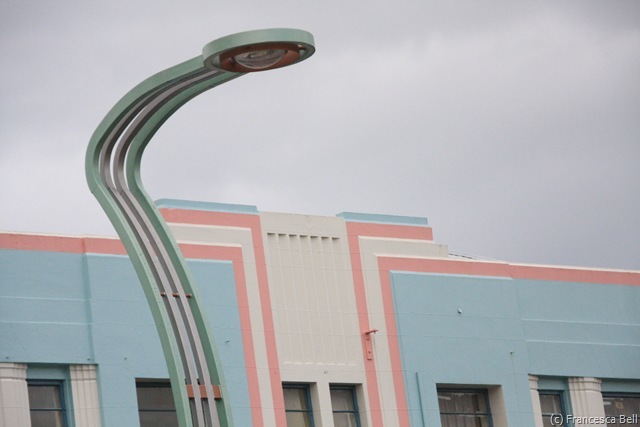 This region is one of the world’s best examples of Art Deco architecture after a seismic event raised Napier and some of the surrounding towns to the ground in the 1920s. Apart from the endless beaches that surround the islands coastline there is also the unforgettable landscape of the Marlborough Sounds and the Fiords. Where mountains touch the ocean. 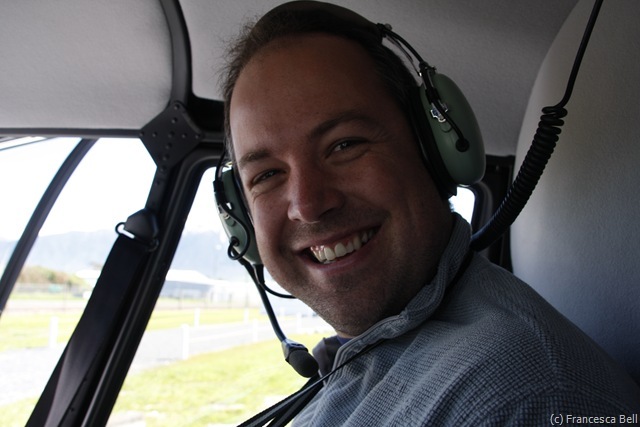 These fascinating places are a privilege and a pleasure to visit and allow you to get safely out onto the water at look back at New Zealand. We thoroughly enjoyed the wonderful tramping, wildlife, kayaking and fishing in the Marlborough Sounds during our two visits here. The people were lovely and very welcoming with a compatible sense of humour. The Fiords were awe-inspiring and reminded you of the natural power at work here. The shear scale and uninhabitable nature of this place to humans gave it a particularly special quality and reminded you that this place was here before us and would be here still when we are long gone. 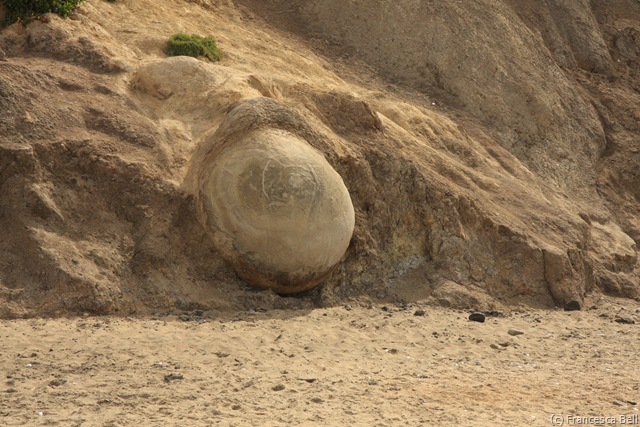 The Catlins on the south east coast of South Island revealed to us the strangest sight I have seen on a beach. 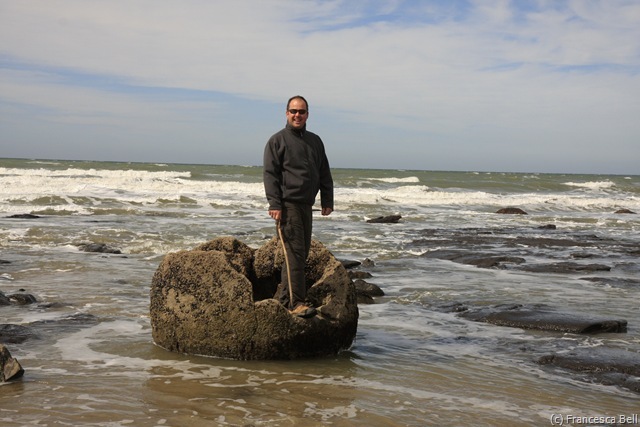 The Moueraki Boulders are not yet understood, but science thinks they were created underneath the sea and since the seabed has been exposed these large round boulders are slowly being exposed from within the cliff and remain on the beach. 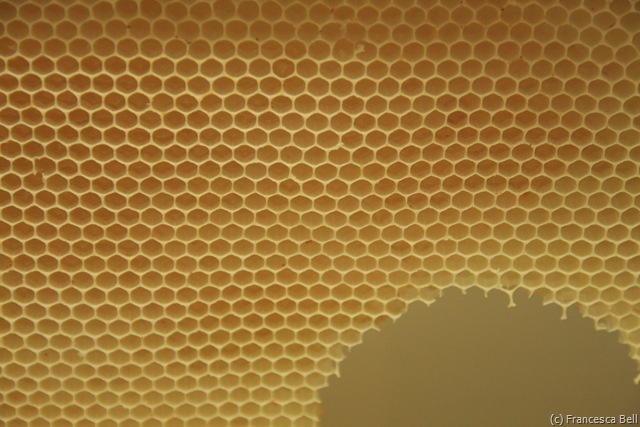 Some have been ‘cracked’ open and expose a thick wall with a hollow centre. Bizarre. 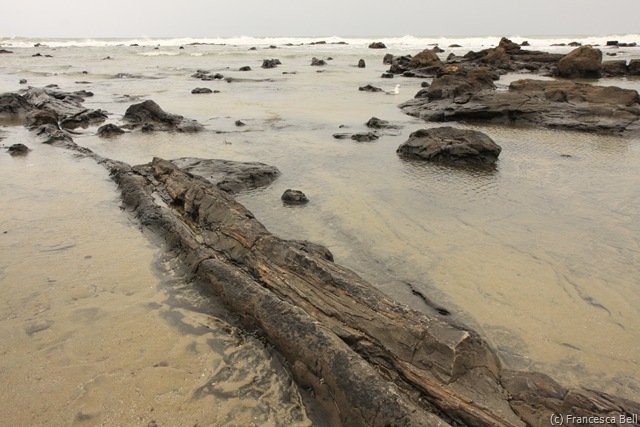 Still within the Catlins area, Curio Bay reveals the petrified remains of an 180 million year old indigenous forest. These fossils may have been linked to with the coast of South America forming Gondwanaland. Today you can still see many of the stumps and trunks of these trees lying on the sand at low tide. Magical. 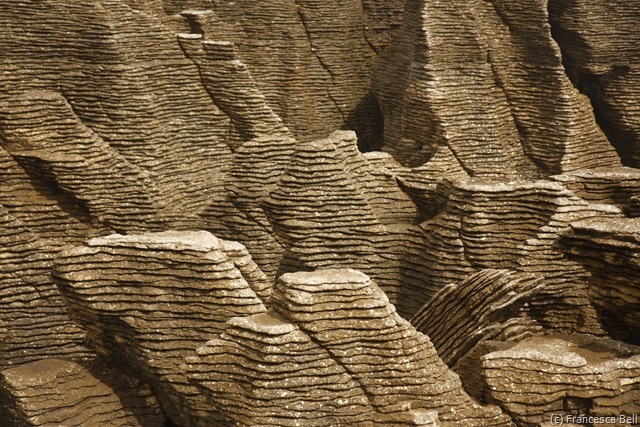 Experts are still unclear about the exact formation of the Pancake Rocks and why they should have formed in layers. They tower high out of the ocean like a mixture of a pile of jigsaw pieces and a vast game of Jenga. 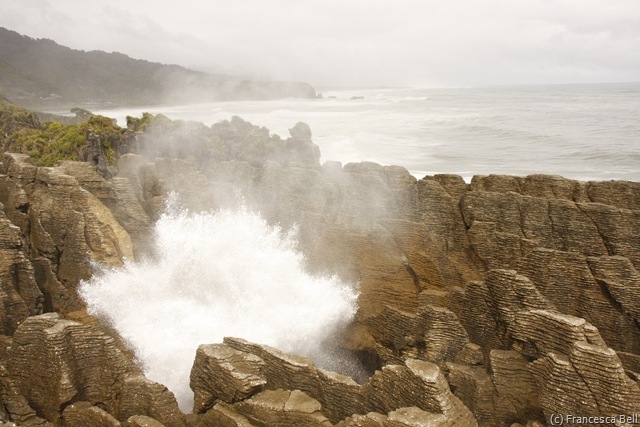 Over time the sea has found a way through the rock creating blowholes with impressive displays of might. It is worth the wait to spend time at each blowhole to see the really big waves come under the rock and explode through the opening to the sky. Surrounding the coastline is a plethora of opportunities to see wildlife both on land and in the ocean. South Island is the ideal place to go to experience this. 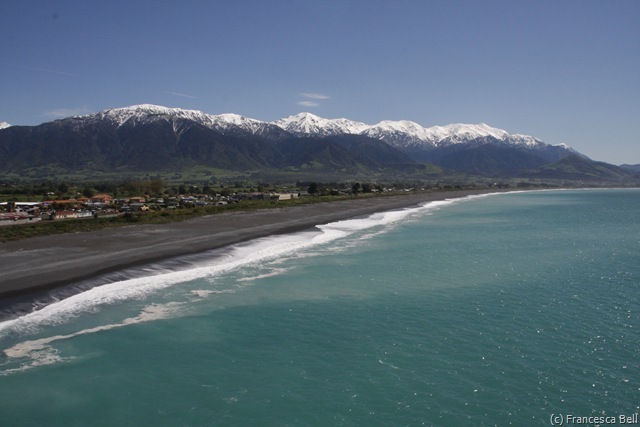 Whales of all varieties breach around Kaikoura, attracted by the vast larder brought here by an underwater ridge to the south. 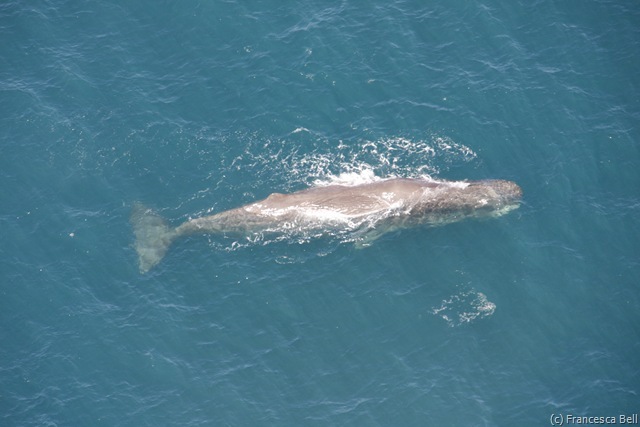 The best way to see these beasts of the ocean is from the air by chopper. The sperm whale we saw was sleeping at the surface, identified by the longer periods between breaths. At 100ft above the clear water we could see the eye, long mouth and vast tail of this incredible creature from the deep. 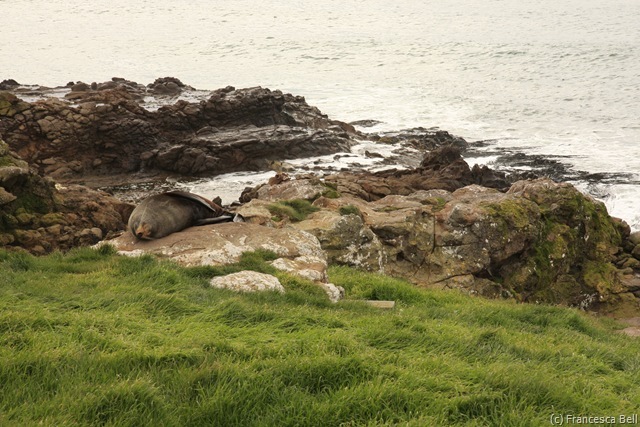 The Otago Peninsula’s rugged shores claim an impressive share of NZ’s wildlife for its size. The vast Royal Albatross roams the skies over protected craggy cliffs on only the windiest of days. Seals lollop over the rocks at the oceans edge. Penguins surf and dive the seas only to waddle ashore for rest and breeding. Arabella was in here element, but this is not to say that the wonder if this place passed us by. Equip with binoculars and vast zoom lenses we got up close and personal with as many birds and mammals as was possible here. You can pay to see the penguins, but for us it was always the ultimate experience to see these creatures naturally going about their lives. Sadly New Zealand’s national bird, the illusive Kiwi, is not easy to find in the wild as they are naturally both shy and nocturnal. 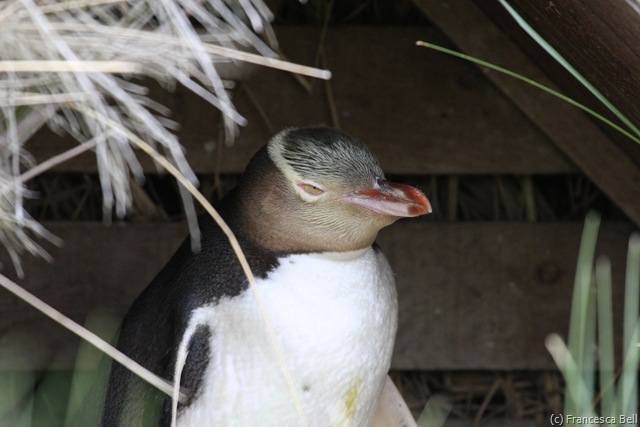 So we visited them at Kiwi Zoo in Queenstown where they work hard to protect these flightless birds from extinction by ferrets, weasels and other such creatures. About the size of a chicken, they pair for life and only produce one egg each year and are said to share DNA with the emu and the ostrich. Well this concludes our highlights though there is so much more to see, so get going!